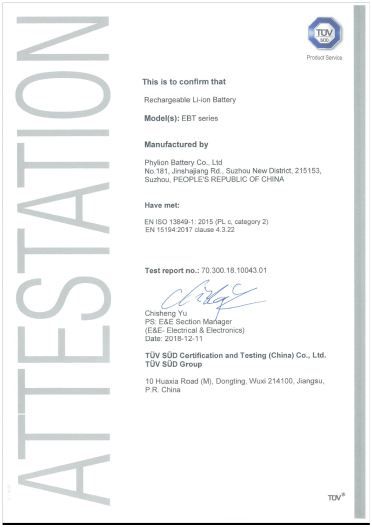 LEVA-EU member and battery manufacturer Phylion has received from TÜV Süd a technical report stating that the company is now officially EN ISO 13849-1:2015 (PL c, category 2) and EN15194:2017 clause 4.3.22. certified. Since 2006, Phylion has distributed more than 3 million e-bike batteries making it one of the leading manufacturers in the industry. According to Phylion they are the first battery manufacturer to be certified based on combination of software and hardware solutions for the full range of EPAC batteries. The revised EPAC-standard EN 15194:2017 will be definitely come into force next April. It includes stricter reliability and safety requirements for electric bicycle and electric system. Phylion was one of the first lithium-ion battery suppliers on the e-bike market in Europe. After some years of experience, the company opened a European office in 2009. At that time, the Netherlands was their main market in Europe with a strong focus on e-bikes. Phylion only produces high power lithium ion batteries. The name Phylion derives from the ‘Physics research institute of the Chinese Academy of Sciences for Li-Ion’ based in Suzhou, near Shanghai.